At last year’s Canuck Place Adventure Race there was a very special 4-legged participant on the course. Canuck Place therapy dog Poppy took on the race for the first time! 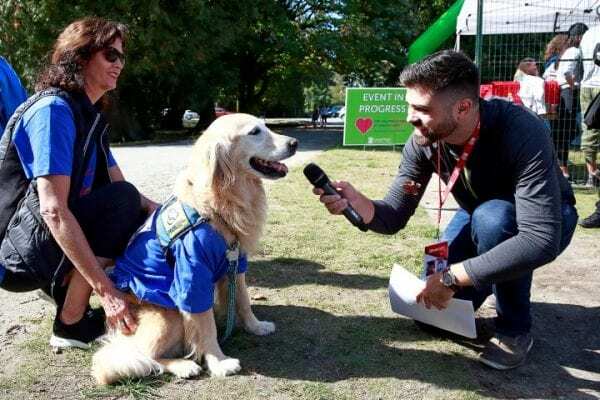 Along with an extensive training regime (which included numerous treats, frequent petting breaks, and extensive reassurances that she is, in fact, a good girl), Poppy raised over $500 to support her friends at Canuck Place. When race day came she joined Canuck Place kids on the adaptive route, braving the ocean in her kayak, and accompanying kids and families as they used adaptive bikes and trailrunners to complete the bike and running portions. Poppy’s grand finale was the kids obstacle course, where cheered on by her many fans, she very well may have set a course record. But her favourite part of the day had to be the post-race celebration where there were plenty of people on-hand to offer up water, treats, and even a little head massage alongside the other racers. Poppy never turns down an opportunity to makes a kids day at Canuck Place, whether it’s playing catch, serving as a fluffy pillow for a sick child, or making sure that everyone is having fun on race day. She’s up for any challenge, and that’s why we’re so grateful to have Poppy share her patient and adventurous heart with all of us at Canuck Place Children’s Hospice. You can join Poppy at the Canuck Place Adventure Race. Register today or donate to her page.